“We can’t thank Desiren Photography enough for their brilliant work on our wedding day! We first came across them when a friend was also looking for a wedding photographer and asked us to come along and meet them for a quote. From our first meeting we knew Desiren were the photographers for us. Sash was welcoming, accommodating and actually listened to what we were after which was the complete opposite of the other photographers we had previously met with. We liked the samples they had to show us and that they were able to demonstrate their ability to change their style according to the customers desire which was really important to us. At that meeting, they offered us a deal we simply couldn’t refuse and we booked them right away! On our big day, the boys were just incredible. They were punctual, well presented, friendly and easy going. They managed to be there every step of the way without being intrusive. They were both very organized and structured but also spontaneous and happy to give things a go that we had not planned for. The results are spectacular! We absolutely love our shots and Sash has put together an incredible album for us. We can’t wait to pick it up!!! We really can’t say a bad word about Desiren Photography. We recommend them very highly!!!! You would be crazy not to book them for your special day. Thank you Steph & Peter, we equally loved working with you and are proud to have produced such results! 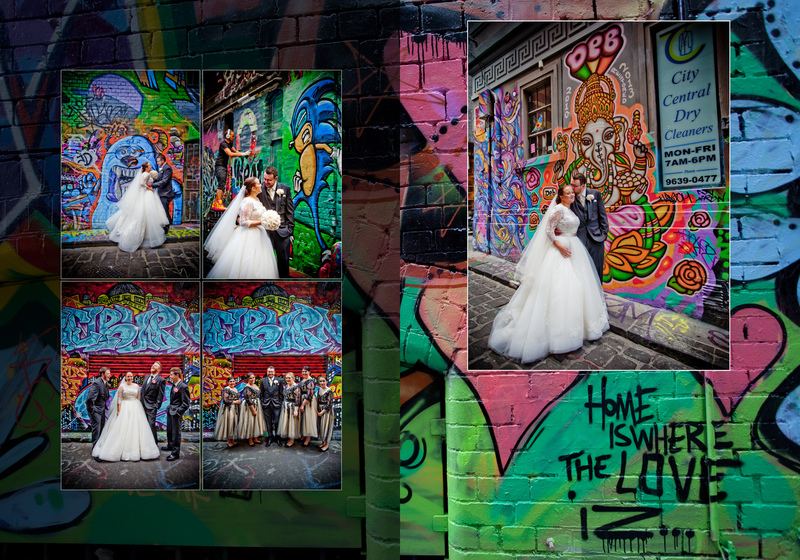 The image is one of the spreads in the album, one of the best graffiti lanes in Melbourne – Hosier Lane.